Choosing to wear a wedding veil comes with lots of decisions. What type of veil looks best with your face and wedding dress, to how to wear it, what hairstyles work best with a wedding veil and what accessories will work too. First things first: choosing the right veil. Just like the rest of your bridal accessories, you want to put a little thought into your selection. A few things to consider: color, level of detail and your reception venue. Try to choose a veil in a similar shade to your gown (this probably isn’t the best time to color block), but don’t get too hung up on this detail. Your gown and veil probably won’t be from the same designer, so the colors won’t match perfectly, but as long as the veil is in a similar shade it will blend in with your gown. 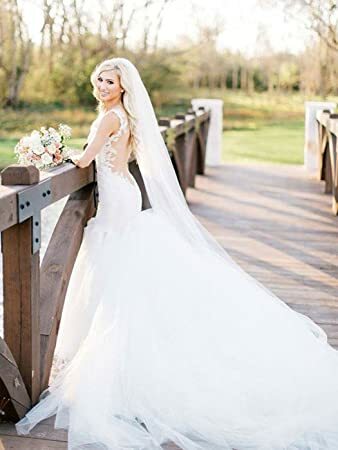 You won’t believe how many shades of ivory and white are available.” We suggest choosing something simple for a dress that is heavily embellished, but for a more understated gown feel free to jazz things up with rhinestones, lace or other intricate details. Once you’ve picked a style you love, it helps to know where and how to wear it. In general, the veil sweet spot is the crown of the head, where your head starts to curve downward, or just below. It really illuminates the bride’s face. Before your wedding day, we recommend testing out comb placement. You want to see how the blusher (if there is one) hangs and where the bottom edge hits to find the spot that is most complimentary to your overall look. Veils can be fastened with combs or clips. For extra hold, you can slide bobby pins at a perpendicular angle to the teeth of the comb or make an “x” along the teeth of the comb. The halo or drop veil is on-trend right now and has a distinctly bohemian style. An illusion comb is stitched in with invisible thread to allow the veil to almost float on top of your hairstyle. It can be placed at the crown of the head or just below. And don’t worry too much about matching the color of your veil to your wedding dress. As long as the shades are close, they’ll blend nicely together. 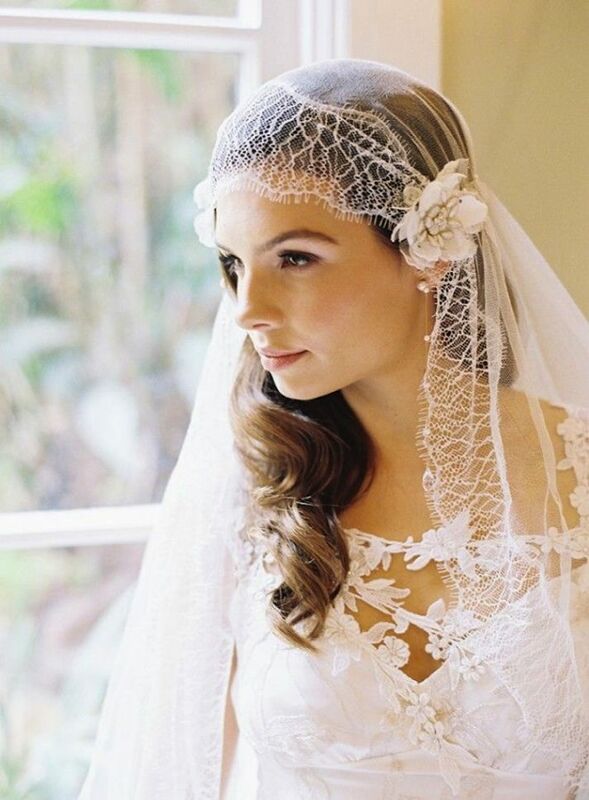 Tip: To really highlight your veil, add a hair vine or elegant headpiece. To add a vintage or bohemian edge to your look a Juliet cap veil is it. There are two ways to wear this style. You can either take a lace or bead-trimmed veil and wear it as a cap, with the sides pinned back with combs or pins behind each ear, or with a veil attached to a separate cap. Tip: Add something extra to your veil between ceremony and reception. Flowers, combs and pins are all fun ideas. Traditional veils like the elbow length, fingertip, chapel and cathedral styles can be worn with or without a blusher, depending on whether or not you plan to cover your face for the ceremony. Typically, they are placed at the back of the head, but longer veils can be placed further back. Tip: A long tulle veil like this one could crinkle easily. Have it steamed (not ironed!) before the wedding day. We love the modern edge of a blusher veil, especially when paired with a lacy, feminine gown. Like the more classic styles, blusher veils are placed at the crown of the head, but can be made longer or shorter, depending on how far back you place the comb. Tip: Want a more structured look? Instead of a nylon blend, choose a blusher in a heavier and more opaque silk tulle. The birdcage veil is the signature accessory for a vintage-glam wedding. A cage veil is not always a standard size or shape, so you should find out which design is best for communicating your signature style. I recommend a 9″ cage veil length. It’s the perfect length to place the veil off to the side of the head and drape across your face diagonally to allow your lips to be free. Tip: Try not to exceed 9″ — if the netting is any longer, it could come in contact with your lipstick, leaving you with a smudge on the netting and possibly your face . A Word: Not feeling the veil but plan to wear one to please mom or grandma? We recommend wearing your veil lower on your head to avoid having it distract from your gown or face. Another thing to consider if you want a subtle veil is width; a narrower cut will lay flatter and offer more transparency than a wider, gathering veil.